The uses for men's promotional t shirts and unisex t-shirts are nearly limitless. These custom logo apparel items can be part of a uniform for work or athletics, used as a giveaway, given as a gift, created to commemorate a special event, designed as promotional attire for a band or product, or made just for fun. T-shirts are pervasive in today's wardrobe; everyone wears them, therefore everyone is happy to receive them. Having men's custom t-shirts and unisex t shirts on hand ensures you'll always have something that people will be happy to wear. The choices available for promotional t shirts are almost as limitless as the reasons to make them. For sizing options, there are shirts available in both men's and women's sizes. Men's shirts are available ranging from extra small to 4XL, while women's shirts range from small to 5XL. There are short and long sleeve shirts available for both men and women, and options for scoop, crew or v neck tees as well. In addition to nearly the entire rainbow of color choices, ePromos also offers custom t-shirts in a few different tie dye patterns. There are also choices of custom logo apparel in different weight cottons, jersey or performance fabrics. 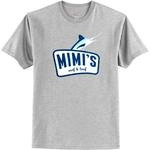 When trying to decide on a giveaway item, men's and unisex promotional t shirts customized with your image is an easy go-to, but of course, you can use custom tees for much more than just giveaways. Feel confident in ordering a custom t-shirt from ePromos – you will have a quality piece of apparel on hand that anyone would be pleased to own. Call us today – we're proud to offer the best customer service, prices and selection!